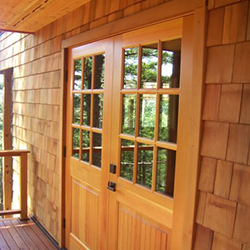 Here at Island Sash & Door, you will see a great variety of styles and types of exterior doors. With the great number of vendors we work with, the variety of styles and types of exterior doors are almost unimaginable. From panel doors made from wood, fiberglass, steel or composite material to glass panel doors of different sizes, shapes and textures (always double-pane to increase energy efficiency), the look and feel will enhance any entryway to your home. Styles also include Dutch and French style doors. Also available are doors made from several reclaimed wood species. Reclaimed woods are environmentally friendly and add warmth and character to your home. Some of the exterior doors we offer have a rich wood exterior and a remarkably strong core that is highly resistant to warping, shrinkage, and splitting. Laminated Veneer Lumber (LVL), is the key to minimizing dimensional shift in doors due to seasonal changes of weather and provides the highest quality product possible. For your patio door needs, IS&D has options like a swinging patio door system we offer as an alternative for wood or vinyl sliding patio doors. Whether your need is new construction or a remodel project, the system can be in-swinging or out-swinging to meet your space and entry needs. The system employs one fixed door and one swinging door to enhance performance and security. An optional phantom screen is also available in white or bronze. Along with the awesome exterior doors available are an equally impressive variety of interior doors. Again, the styles and materials are numerous. Our trained staff can assist in the entire process from selection to delivery. From simple panel doors to bifolds (with and without glass) to louvered options – the available selections are impressive. Even as your entry doors will invite your guests in, the interior doors will make their own statement from comfort to class.